A brotherhood is defined as “an association, society, or community of people linked by a common interest or trade”. This could be a relationship built out of love or respect for what you do. The unity behind truck drivers allows individuals from different backgrounds and beliefs to share ideas with one another in their noble profession. For Edward Belbin, trucking is a brotherhood and his dedication to creating a positive environment for every trucker is incredible. Edward Belbin began driving in May 2013 and is currently running his own business as an Independent Contractor with TransAm Trucking. “I always wanted to be a truck driver, and when I got the opportunity, I knew I had to give it a shot. You get to see parts of the country that normal 9 to 5 jobs don’t ever get to experience.” Like many other drivers out there running their own businesses, Edward drives to support his family. “It is a lifestyle and a choice you have to make as a truck driver to do the things for your loved ones.” Edward is from the beaches of Hampton, Virginia but appreciates driving in the Midwest the most. “I just enjoy the openness of the plains and how most areas are pretty accessible for trucks,” he explained. While over-the-road, Edward enjoys the DIRECTV on the truck, but finds getting out of the truck for a while is great source of entertainment. He also appreciates the fresh air. “Sometimes I get an Uber to go see friends that I have made over the years or just check out attractions in the area.” Throughout his years of driving, Edward has made many friends while over-the-road. His enthusiasm to share his ideas and help other drivers has made him a perfect fit for the TransAm Trucking Mentorship program. The TransAm Trucking Mentorship program pairs up recent CDL graduates with TransAm Mentors. Becoming a mentor involves an application process, a phone interview, and training classes to certify each mentor before they get into a truck with a mentee. Darren Whiteside, Manager of Training & Development, manages the Mentorship program and is ecstatic to have Edward as a part of this program. “Ed is always so even keeled. Ed’s attitude with everyone I have seen him interact with is the same: upbeat and welcoming. He always makes a point to make his mentees understand and feel that they can ask any question without judgement. Ed, on many occasions while visiting my office, takes phone calls from former mentees with questions. He never lets the calls bother him; he answers each call and question with a kind voice and a smile that can be heard over the phone. It is a pleasure having Ed on our Mentoring Staff,” said Whiteside. During his time as a mentor, Edward has had a wonderful influence on many individuals’ first experiences as a truck driver. Edward believes that by helping drivers progress in their career or business, he can create a better environment on the road for other truck drivers and the motoring public. Edward radiates positivity. When asked what advice he would share with newcomers in the industry he said, “Don’t be afraid to ask for help – whether that be for logs, backing up, or paperwork. 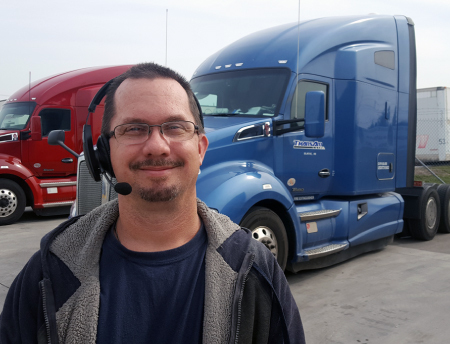 Someone is always willing to help you.” Edward sees trucking as part of a brotherhood. He described it as a group where individuals look out for one another and create a better place for everyone to excel in their profession and their business. It is unmistakable that Edward has had a great impact on those around him. Thank you Edward for your ongoing determination to create a better tomorrow and for bringing your business to be a part of the TransAm Family. We truly appreciate everything you do.